The slot machine game Mr Cashback is one of the top 20 online slots games at real money casinos for a reason. The Free Games feature gives you 12 free spins with a 2x multiplier & up to 5 frozen wilds per spin for up to 4 spins. You will also get cash back on paylines you haven't won on too which can prove very fruitful. 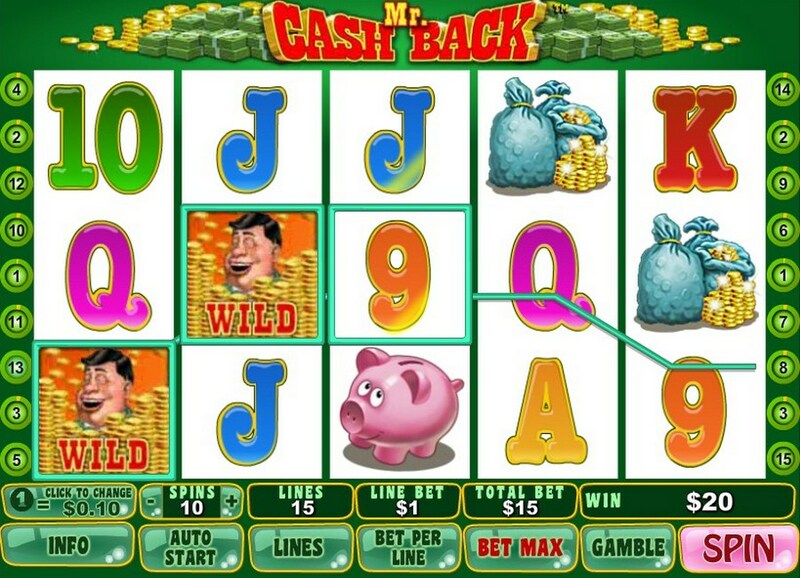 Mr Cashback is a Playtech powered video slot game with 5 reels and 15 paylines. It’s based the Mr Cashback character which aims to make you rich. You can play for as little as 15p a spin to £750 a spin. 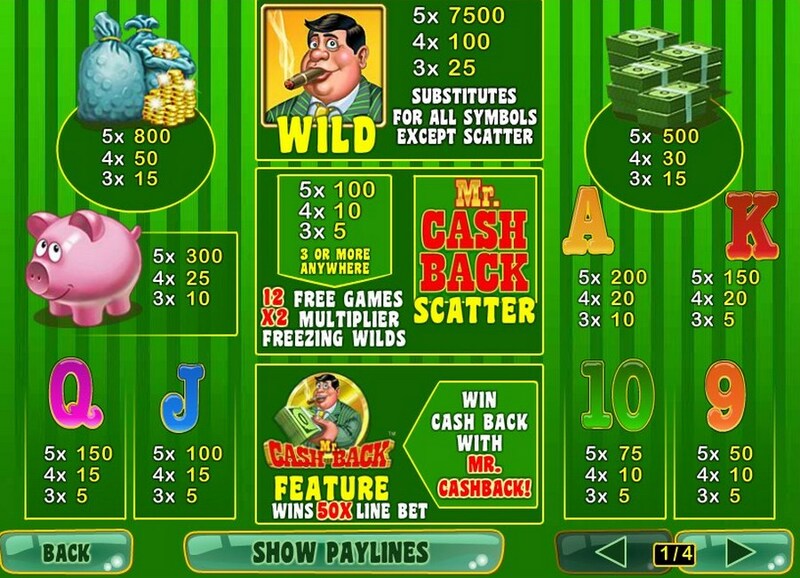 It comes with an impressive 7,500 coin jackpot too which is triggered by getting 5 Mr Cashback wild symbols. The random freezing wilds feature means that after every free spin, between 0 and 5 slots symbols will turn into Wilds and remain frozen for up to 4 spins. This can prove very beneficial naturally. The only downside is that additional free spins cannot be retriggered. Then there’s the Mr Cashback feature which is always active during the main game (not the Free Games unfortunately). This feature adds up the consecutive non-winning spins of each payline. If a single active payline doesn’t give you a win for a consecutive 50 spins, you will win 50 times your stake on that payline. Your stake, however, needs to remain the same for this to apply. If you leave the game and re-enter it, it will save the data. You will notice the there is a status for every payline which is displayed in the frame of the number. It will fill up as there are no wins on that payline. When you trigger cashback, Mr Cashback himself will appear and reveal the line you have won cashback on and show you the amount. Three or more Scatters in any position on the reels simultaneously during the main game trigger 12 Free Games with Random Freezing Wilds feature and all wins doubled. After every spin, a random number (between 0 and 5) of symbols (except Wild and Scatter) turn into Wilds and remain in their position for a random number of 1 to 4 spins, during which they substitute for all symbols. New Freezing Wilds cannot appear one on top of the other. The Free Games cannot be retriggered during Free Games. To start the Free Games, click on Click to Start. A message appears saying that a Free Games round follows. Click on Continue to begin and after a while the Free Games begin automatically. During the Free Games, the reels are spun automatically using the same number of lines and bets per line as on the spin that won the Free Games. After each spin, the win is displayed in the Win field. 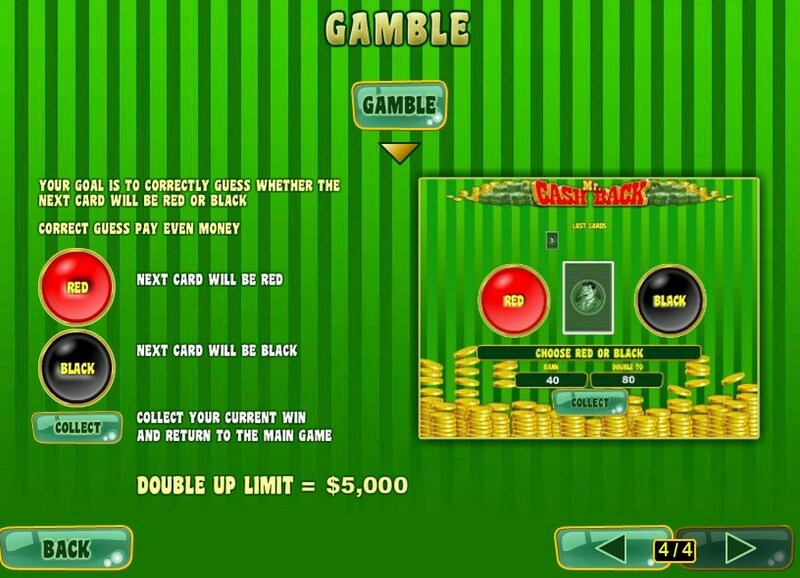 The Free Spin Win field shows the accumulated winnings from the current free spins. Clicking Continue will return you to the main game. Free Game wins are added to the payline and Scatter wins. If the Free Games are triggered during the Auto Start mode, the feature begins after the player clicks on Click to Start and then Continue on the screen introducing the Free Games. When all Free Games have been played and the player clicks Continue on the screen summarizing the Free Games win, the Auto Start mode resumes. When returning to the main game, clicking anywhere on the screen stops the win ticker and displays the full prize. Make your bet, spin the reels, and maybe you'll find yourself not only winning back some of what you lost, but also breaking well into the positive column!